The world recognized company manufactures and supplies Sleeve Wrapper with Shrink Tunnel Shrink Wrapping Machines, which are used to pack heavy products and for high production. The film used in this application is LDPE or LLDPE shrink film. 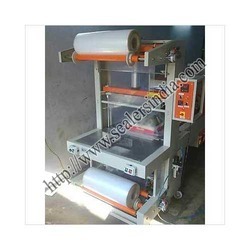 In this Shrink Wrapping Machine 2 rolls of film are used and automatic un-winding system is provided for film dispensing. The sealing system is a special type knife sealer, which seals and cuts the film with uniformity and consistently, air-cooling is used for cooling the seal. Our Sleeve Wrappers are usually combined with heavy duty shrink tunnels for better output and packaging results. These are available at very affordable prices. Sealers India Agencies have high reputation and recognition in the market for our explicit range of effective and high working packaging and sealing machinery. Our extensive experience in this particular industry have enabled us to manufacture world class standard machinery, which are exclusively used in the packaging industry. Our assortment of machinery comprises of different type of machinery including Shrink Wrapping Machines, Vacuum Packing Machines, Blister & Skin Packing Machines, Vacuum Forming Machines, End of the Line Packaging Machines, Pouch Sealing Machines, Cup / Cap Sealing Machines and Allied Packaging Machines from chennai, India. We have employed high professional technology standards to achieve higher standard of excellency with firm commitment and determination to provide highly reliable packaging machinery and equipments to our customers which come from different industries. We are looking for inquiries from South India region including Andhra Pradesh, Karnataka, Kerala and Tamil Nadu and cities like Bangalore, Chennai and Hyderabad.